To sum up: the ancient tradition of folded chasubles disappeared officially from the liturgy in Holy Week 1956 (1) and from the rest of the Liturgical Year in 1960. This requirement applied not to only to cathedrals and collegiate churches, but to larger parish churches and the chief churches of religious orders where a solemn penitential liturgy was performed with the assistance of a deacon and sub-deacon. In an interesting aside, the liturgical historian, Fr. Josef Braun, S.J., noted in 1914 that folded chasubles first went out of use among some deacons and sub-deacons in Germany at the beginning of the 20th century. (3) In other words, Germany, the seed bed of the Liturgical Movement, led the way in abandoning them. The excuse given for discarding the folded chasuble was that the Church could drop “outmoded” symbolism so as to set free the “inner spirit” of penance and make it more accessible to modern man. But destroying outward forms that had been consecrated by centuries of Tradition, far from liberating the spirit that inspired those forms, caused both loss of form and spirit – as a visit (not recommended) to a modern day Novus Ordo would amply confirm. 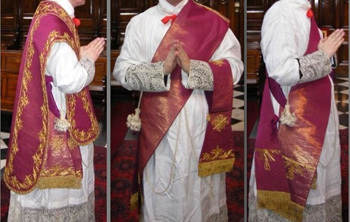 By its deliberate decision to abandon the folded chasuble, Pius XII’s Commission pitted itself not only against the authority of Tradition, but also against a symbol of those core values to which priests during many centuries had given their allegiance. Its abolition by Pius XII in the 1956 Holy Week reform was only one strand in a far wider fabric of measures, which would later be adopted by the reformers to eliminate traditions that made visible and apparent key concepts of the priesthood. Like a dropped stitch in a knitted garment, the loss of the folded chasuble caused some essentials of priestly spirituality to begin to unravel. From this, we can see the gravity of discarding a tradition that had for centuries been a significant element in the Roman Rite. The fact that both Mgr. Gromier himself and the folded chasubles about which he spoke with great pride are now regarded as curious remnants of the Church’s ancient past, and of no importance to modern times, is a telling example of the long-term effects of the Holy Week reforms. It was a startling innovation when the 1951 Ordo instructed the priest to sit and listen to the reading of the Prophecies at the Easter Vigil rather than perform the traditional role of reciting them himself at the altar while they were being chanted by other ministers. This was, initially, only optional and ad experimentum. But the most potent blow was struck by the new ruling in the 1956 Ordo, issued by the Holy See on the Pope’s authority, extending the suppression of the priest’s role to all the scriptural readings during the solemn celebrations of Holy Week. (4) This meant that no priest of the Roman Rite could perform, as celebrant, his centuries-old obligation of reading the Lessons, Epistle or Gospel (the Passion) during Holy Week when there were other ministers available to undertake the task. 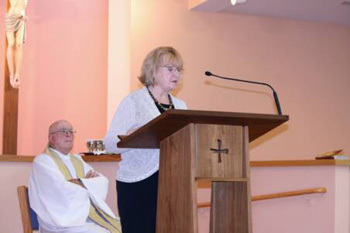 But that is because their sensus catholicus has been negatively influenced by the liturgical reforms insofar as they no longer understand the fundamental doctrinal principle underlying the custom of “duplication,” which involves the nature and purpose of the biblical readings in the liturgy. Before 1956, the obligation for the celebrant to read the Scriptures in the liturgy was a symbolic reminder that he was not (as commonly thought today) conducting a Bible reading session for the instruction of the faithful. He wore a chasuble (discarded in the reformed rite) because the biblical readings, including the Easter Vigil Prophecies, were a part of the Mass of which he was the celebrant. His proximity to the altar was an outward sign that the words he was reading came from the Word, the Second Person of the Holy Trinity, Who is made present on the altar at the Consecration. The point of the symbolism was, therefore, to visually reinforce the correlation between Scripture and the Eucharist and, crucially, the priest’s interconnecting role in both. As such a principle could only make sense in a Catholic liturgy, why did Pope Pius XII suppress this hallowed custom in Holy Week? For an answer, we need look no further than the demands of the Liturgical Movement to foster a more “communitarian” approach to the liturgy in which all present are considered to be celebrants. A consistent theme at all the major Liturgical Congresses of the 1950s, from Maria Laach to Assisi, (5) was that the first part of the Mass should be conducted in choro, i.e., with the priest away from the altar, and that he should not “monopolize” all the readings. Pius XII's legislation to deprive the priest of his traditional role and re-allocate it to other ministers for the Holy Week ceremonies may seem of little significance in the wider scheme of things. But to dismiss that reform as unworthy of concern is to overlook the elephant in the sanctuary. That this reform was the start of a systematic encroachment of the priest’s ministerial role in the liturgy, and was accompanied by a steady escalation of lay “active participation”, is evident from what it brought in its train. For, this early deviation from tradition established a new principle that would receive its ultimate affirmation in the adoption of a Protestant-style “Liturgy of the Word” in the Novus Ordo. 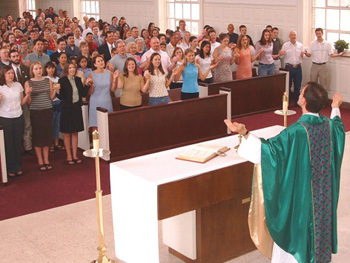 Here, the priest is permanently detached from the altar in the first part of the Mass, while the readings are done at a lectern in the vernacular, preferentially by anyone except the celebrating priest. This was further confirmed by the contemporary reformer, Fr. F. McManus, in his Ceremonies of Holy Week, 1956, p. 48, note 4. The suppression applied to the folded chasuble and, by inclusion, the broad stole in both of its traditional colors: violet for penitential days and black for Good Friday. See A. Fortescue, Ceremonies of the Roman Rite Described, 1920, p. 254. Josef Braun, “ln Allemagna la planeta plicata non si usa più.” in I paramenti sacri : loro uso, storia e simbolismo (Sacred Vestments: their use, history and symbolism), translation G. Alliod, Torino, Marietti, 1914, p. 96. Ordo Sabbati Sancti Quando Vigilia Paschalis Instaurata Peragitur, ‘De Lectionibus’, 1956, n. 15 “Celebrans et ministri, clerus et populus, sedentes auscultant” (The celebrant and his ministers, the clergy and the people, sit and listen). See Part 21: "Liturgical Anarchy Increases under Pius XII"
Although Fr. Braga did not become a member of the Commission until 1960, he had been actively assisting Bugnini's work from the 1950s. In January 1964, he was appointed Undersecretary of the Consilium which produced the Novus Ordo, working directly under Bugnini. Carlo Braga, 'Maxima Redemptionis Nostrae Mysteria: 50 anni dopo (1955-2005)', Ecclesia Orans (an international journal published by the Pontifical Liturgical Institute of Sant'Anselmo in Rome), n. 23, 2006, p. 18. The article contained the text of a conference given by Fr. Braga in 2005 to mark the 50th anniversary of Pius XII's Holy Week reforms.